Demo: Unlike some other software demos, the EZ-DepositSlip Demo is a fully functioning version of the software. You can use all the software’s features. However after many, many, many uses you will get a nag screen. The software never disables and you will always have access to your data. Non-Profit: This version is intended for non-commercial use or for non-profit organizations. We recognize that many non-profit organizations (churches, charities, schools, etc.) have very limited funds, therefore we offer EZ-DepositSlip at $59. You will need to fax us 414 272-6666 your tax exempt certificate when ordering. 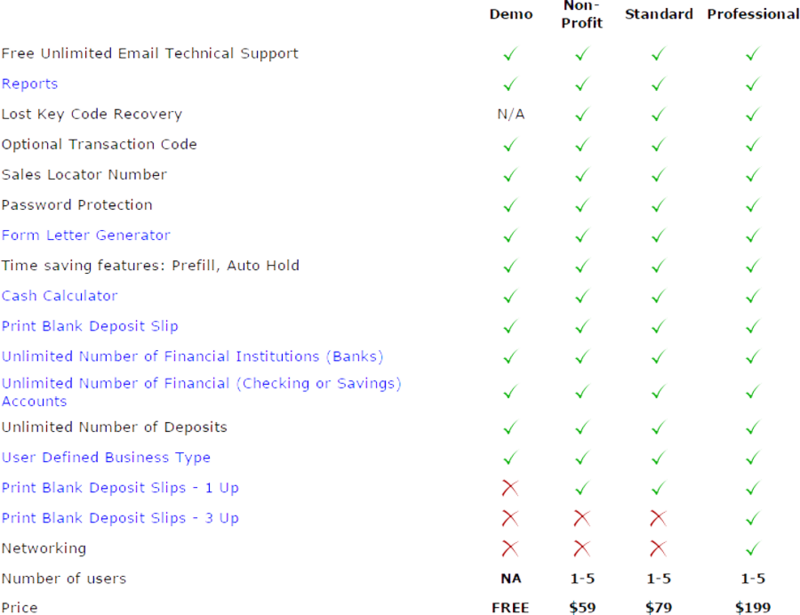 What is the difference between EZ-Deposit Slip Standard and Professional? The main difference is networking. What happens if I loose my keycode? Just send us an email and we’ll send it to you at no charge.